As is the case with most compilations, you come for the star power and you stay for the exciting new artists you’ve never heard before. Doom Mix Vol. 1 is no different, and based upon said star power (well, it’s in my head anyway), I’m demanding the artists I’m unfamiliar with blow my mind with their heady, brilliant, outsider rock, psych, experimental, and electronic work. Good start, then, for HOTT MT, tape opener, because “At Night in Chinatown” is just dream pop gold. Also dream pop gold? Vinyl Williams’s “Ode to Eternal.” Lest you think this comp is heavy on the dream pop, look no further than Tarkamt’s “Outer Gateways,” a gut-churning synth noir that’s as creepy as it is catchy. Traps PS ends side A with “Press Gangs,” one minute of squirrely post punk. Side B stars SCRTS and wrtch go back to back with ambient head trips “Tails Tied Together” and “WEALTH,” respectively. Those are just the discoveries. I love them. I love this mix. It ends with a new Mukqs track, and Mukqs is the best. 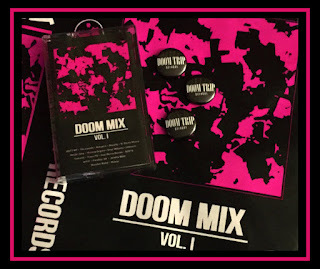 Listen, if you want a variety of weird stuff that you won’t be able to pin down but all sounds just right next to each other, look no further than Doom Mix Vol. 1. I can’t wait for whatever Doom Trip puts out next. Everybody has star power now.